I have just joined the Community here for your thoughts and we thank you in anticipation of any help you may give. We had a questionnaire from Abbey Life regarding enhanced annuity. They have now phoned because of the letter and we have arranged to talk to them Friday afternoon. 1. My husband had a Waiver of Contributions implemented as a result of an accident before he reached retirement age. He does not get a huge amount because he only took out what we could afford at the time . We had hoped to increase it over time, because his employer did not offer one, even so we were pleased we did a Waiver of contributions option. Note: He went onto have a TIA and now has a pacemaker. I also went onto have breast cancer in 2007. 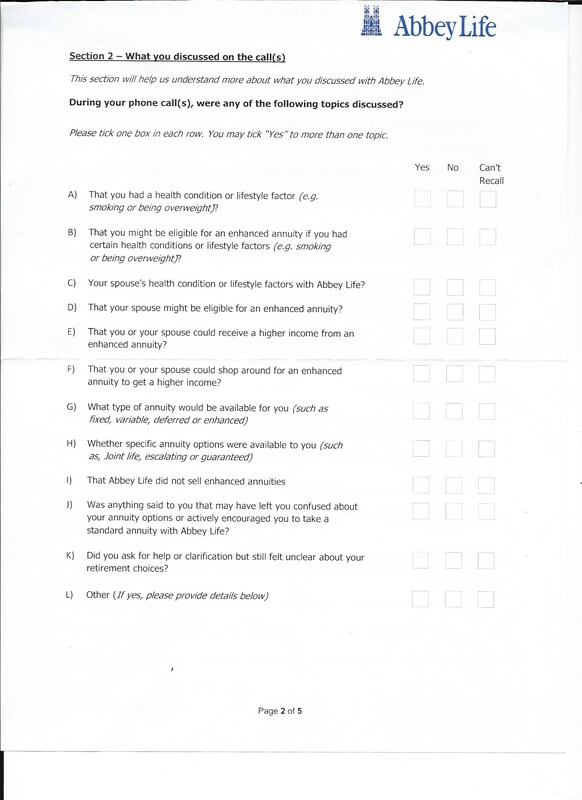 (a) this person from Abbey Life is saying he could help us over the phone to complete the questionnaire. But we are wondering if we should be seeking independent advice now? (b) being my husband was already on 'Waiver of Contributions' then is he in a different category? As I said in my reply to your first post, could you post up a pdf of the questionnaire, minus any personal details please? Thank you - I have scanned these pages but they are saying too large and adjust manually??? Not sure what to do next. My scanner states JPEG format - oh dear not sure how to get over this. Have a read of our upload guide, that should help you. So to summarize. 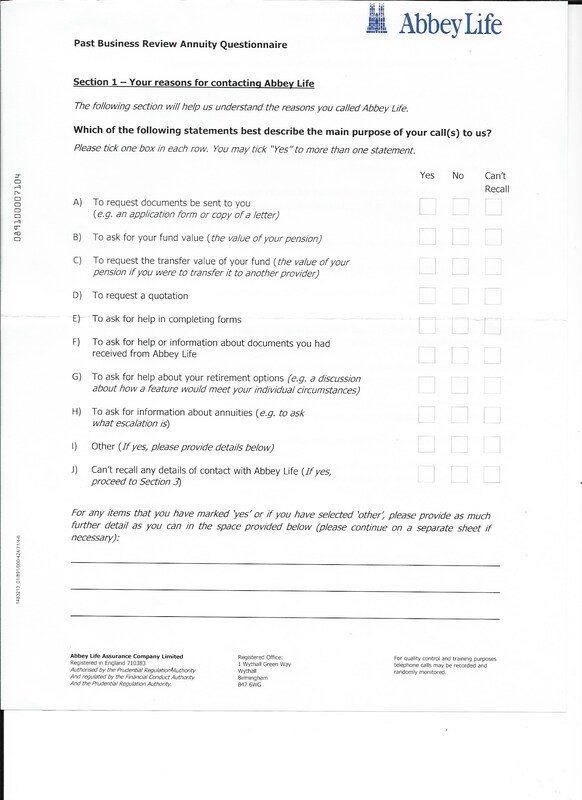 If already on Waiver of Contributions due to accident so is this Questionnaire relevant i.e. Reading through Section 1.
headed your reasons for contacting Abbey Life. Which we didn't - so something like point G - to ask about your retirement options. Never entered our heads felt we only were with Abbey Life. Thank you for the scans, Gilly. It sounds as if they're worried about possible mis-selling if your husband could have had a better annuity rate with someone else. I haven't had a lot to do with mis-selling cases, but I can't see any harm in letting them help you with the form. I would though write what they suggest on the form that you have rather than letting them fill in their own version. That way you can review it afterwards and make sure you're happy with the answers. It does sound a generic form so maybe not all of the questions fit your circumstances. In terms of taking independent advice, that's likely to cost you money unless Abbey are offering to pay for it. I don't know if the government's Money Advice Service do anything like that. How long ago was the annuity taken with Abbey Life and do you have paperwork dating back to that time? If not, I would think Abbey ought to provide it. I expect you'll have other views, but in your situation I would try having the phone call as long as you don't feel they're leading you. Is it with a member of staff of Abbey Life? I believe they're part of Lloyds Bank now. The annuity was purchased in March 2009. My husband had his accident in 1989 and since then was on a Waiver of Contributions - hence Abbey Life continued to contribute themselves. We had forms we had to complete as to how we wanted to take the Annuity BUT never even knew we could go elsewhere for an 'enhanced annuity'. So it is the Waiver of Contributions element that I wonder if this is a factor in this possible claim for compensation if it is appropriate. I'm not sure the waiver part is a factor. Maybe what's more relevant is the amount of the fund that your husband had available to buy an annuity with in 2009. The fact that he had the foresight to use the waiver option to protect himself shouldn't count against him in my opinion. Edit: so Abbey didn't offer you any advice in 2009? I will try and find paperwork with the fund value. (Which I can't remember was much but will see what I can find) Abbey Life never advised that he could get a i.e. second opinion it was just options how we 'used' the funds for the future. 'The premium for this contract is £20856.49 which will provide the following: Initial Gross Annuity - £1,277.70 per annum. Conclusion: Where we are at this point in time and receiving this letter with questionnaire could this 'small amount of fund value' been 'enhanced' we wonder? Thanking you in anticipation of your thoughts. As I read it, Abbey didn't offer Impaired Life annuities at the time but possibly they think they should have suggested you look around in 2009. I would say at this time they should be doing the thinking, just get the information you need to fill in the form and send it back when you're ready. 1. The name of the person we are speaking to and the company he represents. 2. Any advice he gives on completing the form - but - we do it and submit. 3. 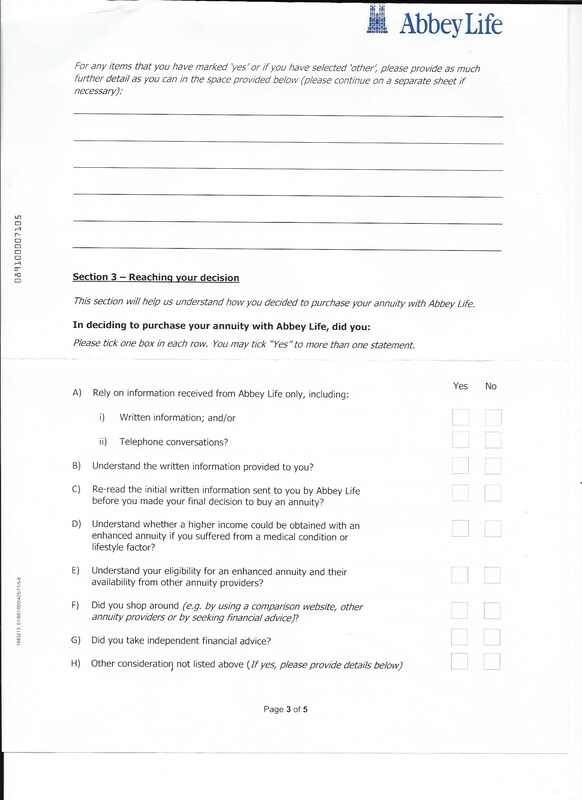 Ask exactly where do we make it quite plain on the form that we were not offered any advice that we 'look around' for enhanced annuity from another provider. © What about my health in 2007 - I had breast cancer and treatment continued for nearly 2 years. Does that play a factor in this? In addition to asking the person's details I would also ask what their job is. It could be something like compliance. Who is the letter from? I would be inclined to lead the conversation if you can, mark the questions you don't know the answers to and try to just talk about those. Your point B. I think their concern is that your husband possibly had health issues that would have qualified him for an 'impaired life' annuity but not with them. If that is the case, he could have taken his fund and bought an annuity somewhere. If it was your husband's pension then this is about his health. Here's a link to Which? on impaired life/enhanced annuities. Looking online it seems they were available in the UK before 2009. Thank you - very useful. I have forwarded the article to myself so I can print it out. Will try and read through and understand tomorrow morning it might go in our head a little better. OH! I would guess half this battle is their own statement saying they didn't offer enhanced annuity - so if they advised us to go elsewhere they need to prove it surely? So I feel they could imply that going elsewhere may have been mentioned -hence - it gets them out of any compensation claims. Might be wrong but all your help gives us food for thought on how to tackle this. Well you could ask them to explain why they ask the question about spouse's health. Hope it goes OK tomorrow, please come back and let us know. Yes - will do. Will get a list of questions by the side of us. How did you get on yesterday, Gilly? Good morning - well he was trying to be helpful with the form. He was from Abbey Life and we have his name. On Section 2 - We were saying we could did not have any calls. He said I can't tell you what was said - but on record - there are calls recorded as having taken place. So he said say if it is how we feel then say 'No' to the questions. Ref: Section 2 - I said on here it mentions Spouse - so would I have been telling them that I had an aggressive form of breast cancer in 2007 with treatment continuing for nearly 2 years, etc. (If they had asked.) He said it is a joint Life Annuity. This morning it is making me concerned that we do not answer correctly because i.e. I did say as far as we can remember no phone calls between us. He said I don't know what the calls were but there is on record you have phone conversations. All I know is we are sure telling us we could go elsewhere never came into it. Especially given with my cancer then at that time I never knew if I would survive - so surely that would have stuck in our head we could get an enhanced annuity if we shopped around. (h) Yes - then we write something like e.g. 'Given the information we were given we did our best to choose an option open to us and we felt committed to Abbey Life. It is only having this questionnaire in front of us and seeing Section 2 that we realize that my wife's health also needed to be taken into consideration'. Phew! This worried me last night and I said to my husband surely they can't take away what they have been paying us now. He said we haven't done anything wrong and would have carried on as we are if they hadn't sent out this Questionnaire. Thank you for being such a support. Hi, thank you for letting us know. So you didn't feel under pressure over the phone yesterday? And are you sending the written form back to them now? I would take time and make sure you're happy with the answers. I'm surprised they won't tell you about the phone calls at the time and also surprised that there was no written confirmation afterwards. I don't think they can take back what they've paid you, don't worry about that. Thank you - whilst I was in the shower - where I do a lot of thinking!! I thought if in any of those phone calls they asked about my husband's continued health issues and my health (I would have said 2007 breast cancer). So if they said we do not offer enhanced annuities but you may qualify so we suggest you look around then - we would have - because it is human nature to want more. Yes - he didn't make us feel pressured and said anymore questions give a call. I could on Monday ask him to find out what those calls were before sending in the form maybe? I will over the weekend see if I can find anymore correspondence from them. 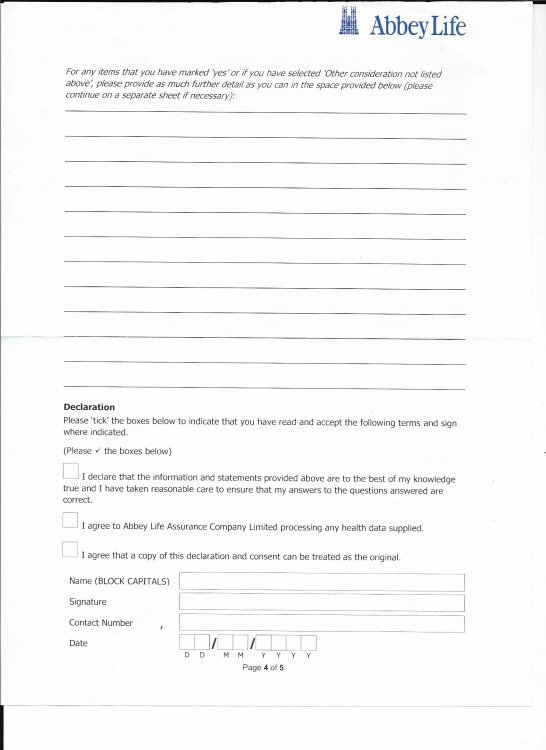 Have found some correspondence from the solicitor and letter from Abbey Life confirming Waiver of Contributions. I am just wondering if there is anything to gain from finding out what the calls were about?